A divorced couple reunite to follow the instructions of their son's suicide note. Valley of Love is very much a faith-based movie. Its Christ references are hammered home, but it's a film that doesn't require its audience to share its beliefs, nor does it seek to alienate non-believers or those of other faiths. American Christian cinema could learn a lot from it. 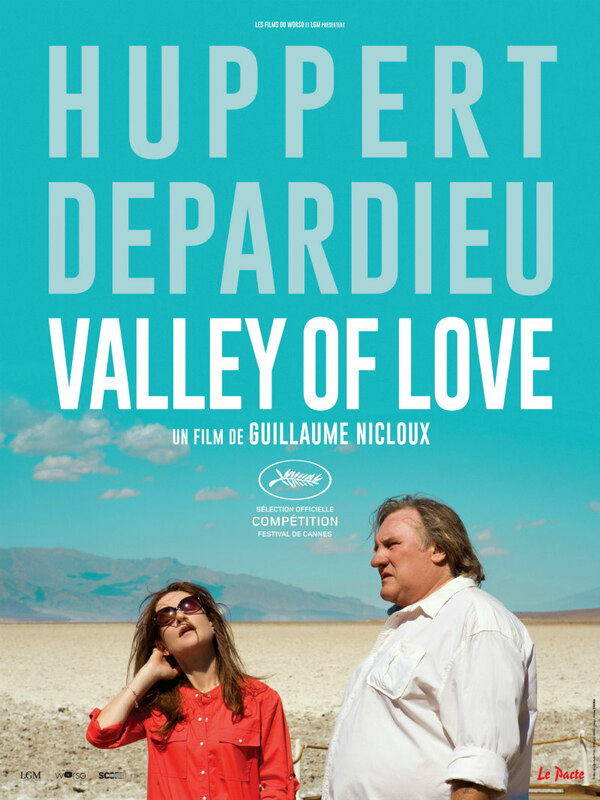 Valley of Love is in cinemas August 12th. With his previous movie, an adaptation of the classic French novel The Nun, Guillaume Nicloux painted a vicious portrait of the Catholic church as an institution ruled by sadists. It's a surprise then to find his follow up, Valley of Love, falling very much on the side of the spiritual, explicitly alluding to Christian themes. A pair of French actors, once married, Gerard (Gerard Depardieu) and Isabelle (Isabelle Huppert), meet up at an Arizona motel. They've been reunited after several years apart by the suicide of their twenty-something son. Both received a letter from the deceased with instructions to visit a series of landmarks in the American South West in a specific order, their son claiming he will briefly reappear upon their visit to the final landmark. Both are naturally skeptical, though the spiritual Isabelle less so than the more pragmatic Gerard, but they've decided to go along out of a combination of respect for their son's wish and a feeling of guilt about the effectiveness of their parenting. America never looks quite as American as when filmed by foreigners, and Nicloux follows Wim Wenders and Wong Kar Wai in setting his movie in the country's most cinematic corner, a geographical location oddly under-used by American filmmakers. The none more Gallic pair of Huppert and Depardieu stick out like a sore thumb among the bubbly Americans they encounter and rudely dismiss; they may as well be the Roswell aliens, far from home and melting in the desert heat. Valley of Love is decidedly moralistic in its narrative, its protagonists starting out as rude and narcissistic, but becoming better humans and bonding emotionally as their journey progresses. Early on, an American recognises Gerard as a movie star but can't put a name to him, and out of pettiness Gerard signs an autograph as 'Bob De Niro'. Later he's confronted by the man and forced to admit his anti-social ways. Most of the movie is a two-hander, and Huppert and Depardieu display the talents that make them French thespian royalty. There are brief encounters with other characters, including a late night meeting between Gerard and a facially disfigured young woman that resembles a lost scene from a David Lynch movie. When the film begins to take supernatural turns in the second half, it becomes clear Valley of Love is very much a faith-based movie, rare for European cinema. Nicloux's Christ references are hammered home - a resurrection in the desert, mysterious scars appearing on Isabelle's ankles and Gerard's wrists - but it's a film that doesn't require its audience to share its beliefs, nor does it seek to alienate non-believers or those of other faiths. American Christian cinema could learn a lot from it.